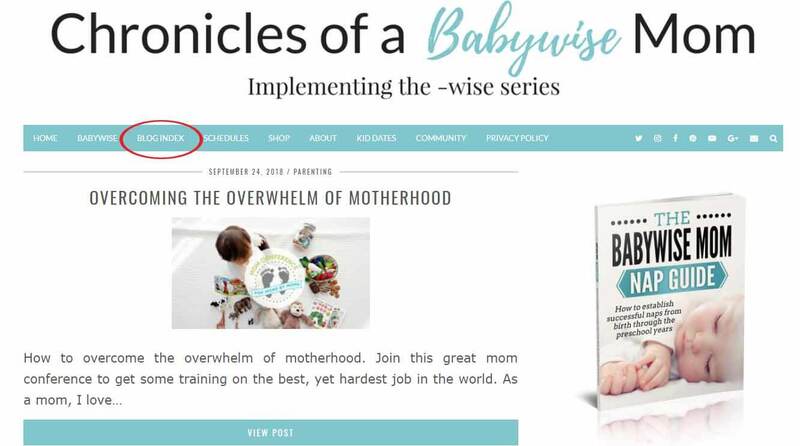 How to navigate the Chronicles of a Babywise Mom blog. Find answers to your Babywise questions. Tips for navigating thousands of helpful posts. 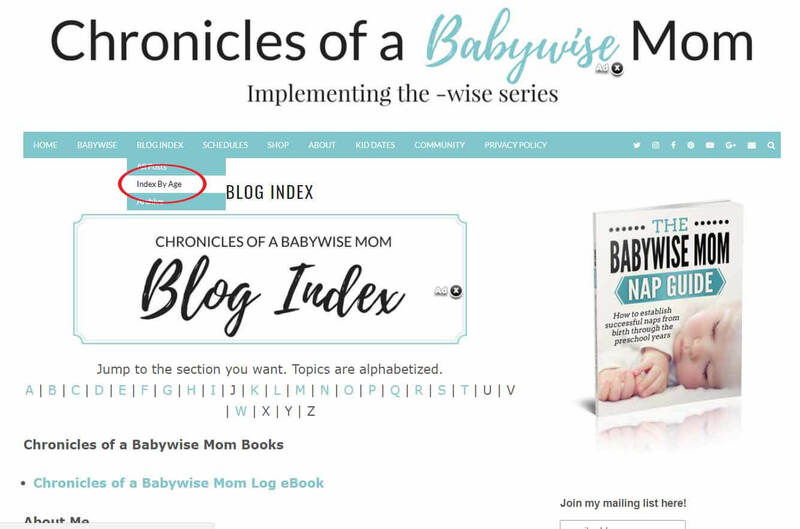 This blog is intended to be a quick reference to find answers to questions you encounter while implementing Babywise, Toddlerwise, Childwise, etc. 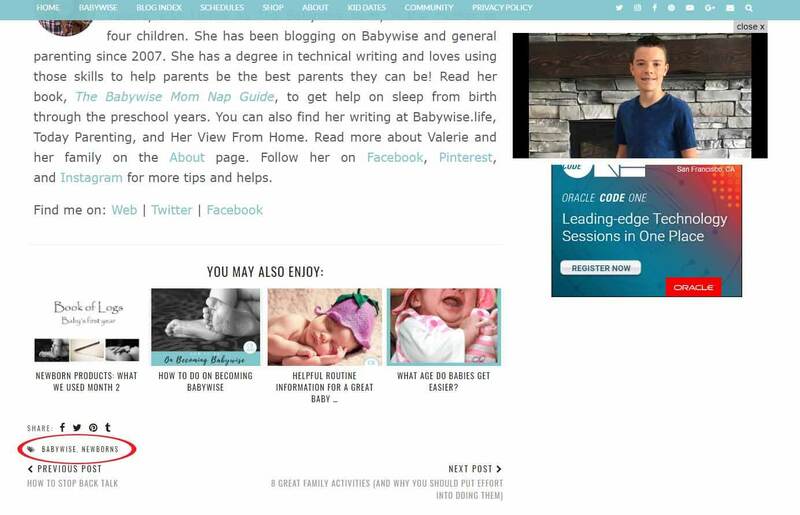 Over the years, it has grown to include all general parenting advice, so you can find answers to most things you encounter with your little one. I know it is a daunting experience to come upon a blog like this that has been in operation for a while. I have tried to make finding answers as easy as possible for you. You can get to the index at the top of any page by clicking the link under the main banner. The blog index is a document I update with a list of everything published on this blog. It is in alphabetical order by topic. Posts are grouped together in categories so you can quickly find what you are looking for. If you know you want to look up “Witching Hour,” you can click on the “W” at the top of the page to jump down to W in the index. In April of 2010, I started adding indexes by age groups. You can click the Index By Age link in the navigation bar from any page. 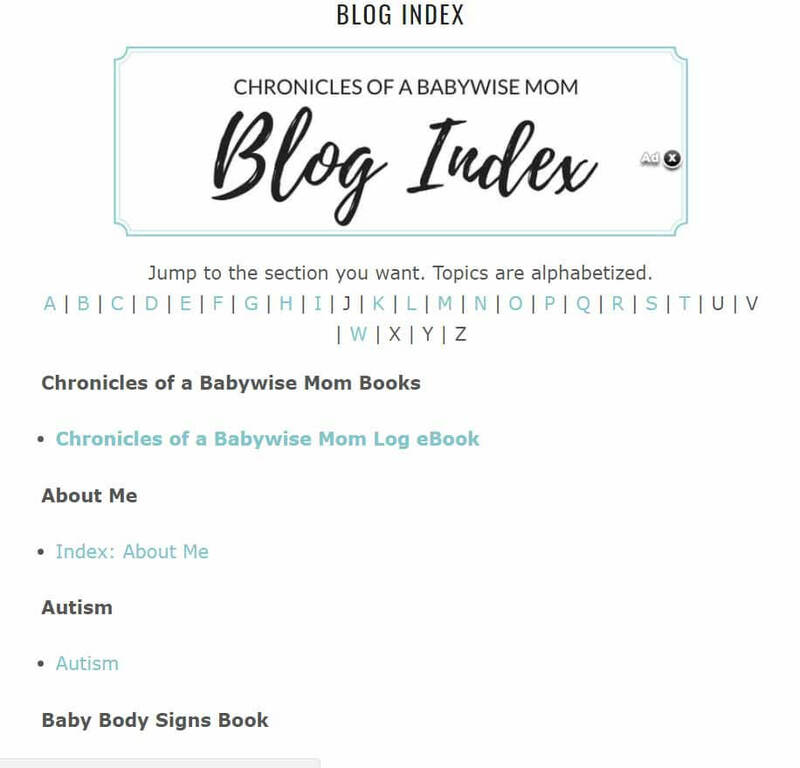 Hover over “Blog Index.” A drop down menu will come up. Click on “Index By Age.” From there, you can see all posts for that age group. I think this is especially helpful for parents of Newborns. You can also get to Archives from the same drop down menu. You can also navigate topics by time of day. If you have a concern about feeding, go to the “Eat” index. 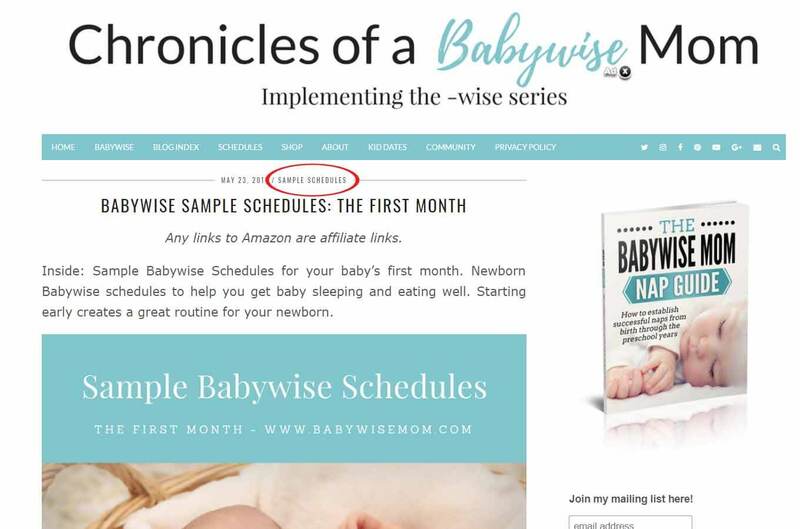 Playtime, go to “Wake.” Naps, go to “Sleep.” Hover over “BABYWISE” in the navigation bar and click your topic. Each post is categorized by topic. If you are on a post and want to see more on that topic, click the category right above the title. This will pull up every post that fits that category. You can also see similar posts by click on a tag. These are at the very bottom of a post. Finally, you can search for what you are looking for. In the navigation bar, you can click the magnifying eyeglass icon to search. If you have a question or problem that is not addressed, simply ask it in the form of a comment on any post. I will respond directly to your comment on the same post. Please do try to find your answer in the many posts I have written before you ask a question. I spend hours answering questions. I am happy to answer them, but the more questions there are, the longer it takes to answer them, which means the longer the wait time before people receive answers. 90% of the answers I give are simply references to posts I have written, so you can more than likely find the answer to your question in this blog if you look. If you are here to debate, please see my debate policy. The current wait time for me to answer a question is listed at the top of the blog in my welcome message. If I haven’t answered it within that time frame, I most likely was not notified of it. If so, simply comment again (on the same post) saying you posted a question. Please feel free to leave your own experiences and advice on the subject of the post also. The more the merrier. 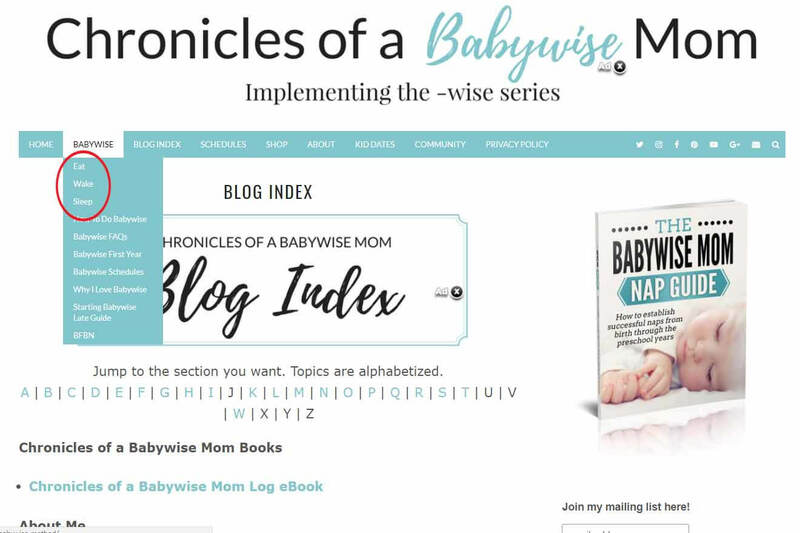 You can also follow me on Facebook, join the Chronicles of a Babywise Mom Facebook Group, follow me on Pinterest, follow me on Instagram, and follow me on Twitter.